In the present study, the AZ 31B Mg alloy was isothermally upsetted by multi axial forging. Two increasing temperatures (350°C and 400°C) and working ratios (0.3 and 0.4 per direction) were selected as variables in the multi axial forging. The forging operation was performed in a 10000 kN industrial hydraulic press at a forging speed of 33.3 mm/s. The grain structure and microstructure of the forged alloy were investigated using an optical microscope. The hardness measurements were taken and correlated with the grain size of the alloy. The key findings from the present investigation are: (1) the grain refinement can be retained by decreasing the forging temperature (350°C) and the reduction ratio (0.3 per direction), (2) increasing working ratio favours the preferential grain growth resulting in bimodal size distribution of grains in the microstructure and that results in significant variation in the hardness, (3) the grain growth is severe for the case of higher temperature (400°C) and working ratio (0.4 per direction) forging condition, and (4) the forging temperature affects the grain growth larger extent than the working ratio. The mechanisms responsible for the grain refinement and abnormal grain growth are discussed in detail. Recently, Mg-Al-Zn alloys (AZ class) are gaining popularity in the structural parts of aerospace, automobiles and electronic devices applications because of their several advantages such as low cost, good recycle ability, light weight, high specific strength, stiffness and machinability, high electromagnetic interference shielding capability properties [1,2]. Almost 90% of the Mg alloy components are currently fabricated using sand or die casting depending on the size and shape complexity [3,4]. However, parts produced from casting processes frequently suffer from inferior strength properties, a coarse grain structure, lack of pressure tightness and casting volumetric defects (micro shrinkage and gas defects). Also, casting of Mg alloys demands costlier or noneco- friendly protective atmosphere such as sulphur plus flux dusting, inert gas or vacuum atmosphere) to prevent fire hazard caused by violent Mg oxidation. These disadvantages of casting prompt for alternative processing methods for Mg alloys. Forging, a cost-effective forming technique, may be considered as a suitable alternative because the processing is carried out at solid state. In addition, the mechanical working refines the grain structure, improves the static and dynamic strength properties, and eliminates the casting defects. However, the hexagonal crystal structure, lack of slip systems (only active slip system: basal slip, (0001)  upto 200°C) and low stacking fault energy affect the plastic deformability and make the alloy brittle at ambient temperature [5,6]. Therefore, the forging at elevated temperature particularly above 220°C is essential to activate additional slip systems such as prism ((1010) ) and pyramidal ((1011) ) slips so that the alloy will have adequate plastic deformability. Also, the dynamic recrystallization occurs at elevated temperature which presumably refines the grain structure and improves the hot workability of the Mg alloys. Advanced forming techniques such as equal channel angular pressing (ECAP), multi-axial forging, high pressure torsion, accumulative roll bonding, friction stir processing are currently emerging to obtain ultra-grain refinement through grain fragmentation by severe plastic deformation [4,7]. Out of these techniques, a multi-axial forging is highly attractive primarily because of its ability to provide near isotropic properties. Other advantages include: (1) no need of specialized tools and dies, (2) very high strain can be imparted easily, and (3) improvement of ductility, tensile and fatigue strength properties through strain induced grain refinement. There are few reports on hot forging characteristics of AZ 31 alloys [8,9]. Studies on multi-axial forging (MAF) of AZ 31 alloy are also reported [10,11]. All of the studies on MAFs of AZ 31 alloys are conducted in the laboratory scale using a compression test facility. Further, these studies are restricted to the forging temperature of 150-350°C in the non-isothermal conditions. The following knowledge gaps stimulated to undertake the present investigation: (1) the isothermal forging characteristics of AZ 31 alloys have not been investigated yet, (2) the relationship between the grain size and the hardness for AZ 31 alloys is not well understood, and (3) the forging characteristics of AZ 31 alloy in the industrial scale at higher forging temperature (>350°C) are not reported yet in the literature. In light of the above facts, the present investigation is designed to conduct multi axial iso-thermal forging of AZ 31 Mg alloy and evaluate their properties at higher forging temperature (350-400°C) and working conditions (ΣΔε = 0.9 and 1.2). AZ31-B extruded billets were selected in the present study. The chemical composition (in wt%) of the alloy is Mg-3%Al- 1%Zn-0.5%Mn. The extruded billets have a cuboid shape with dimensions of 150x90 x32 mm (the axis ratio is 4.68:2.81:1). The billets were heated to forging temperatures of 350°C and 400°C in an oil fired furnace under sulphur protective atmosphere. The billets were forged in all three directions in a 10000 kN industrial hydraulic press. After each pass in the forging, the samples were rotated at an angle of 90°, as shown in Figures 1 and 2 so that they were worked in all three directions. Both top and bottom dies, made up of tool steels, were maintained the same temperature as that of billet to simulate an isothermal condition. The billets were given cumulative strains (ΣΔε) of 0.9 (0.3 per direction) and 1.2 (0.4 per direction). Equal amount of working was given in all directions. The die speed during the forging was 33.3 mm/s. The schematics of the details of forging design are illustrated in Figures 1 and 2. Graphite lubricants were used as a die-work piece lubricant during forgings to minimize the friction and the dead metal zone in the final part. After each pass, the billets were immediately quenched in hot water maintained at 40- 70°C and later, they are heated to forging temperature before next forging pass. After the last pass, the billets were quenched before extracting the samples for testing. The quench delay time between the end of deformation and complete immersion of billet in the quenching media is 3-5 s.
Samples for hardness and microstructure testing were cut in a plane parallel to the final forging direction, as shown in Figures 1 and 2. Hardness of the forging was measured in a Brinell scale with steel ball indenter of 1 mm diameter and indentation load of 10 kg. Seven indentations were taken in each direction randomly and the average was reported as the hardness of the forging. The metallographic samples were polished using standard metallographic technique and etched in an acetic picral solution (10 ml acetic acid + 4.2 g picric acid + 10 ml water + 70 ml ethanol). The microstructures of the samples were analyzed using an optical microscope (Nikon Epiphot). The grain size of the forging was measured using the Image analysis software (ImageJ, NIH, Bethesda, Maryland, USA) and the mean value was determined from averaging minimum 50 grains. The mean grain size value was correlated with the hardness. Figure 1: Multi axial forging (MAF) design for the cumulative strain of 0.9 (30% working per direction). Figure 2: Multi axial forging (MAF) design for the cumulative strain of 1.2 (40% working per direction). From the multi-axial isothermal forging process, it is understood that the alloy can be imparted a maximum strain of 120% without cracking in an industrial scale for the selected pr ocessing parameters. The activation of additional slip systems such as prism ((1010) ) and pyramidal ((1011) ) slips and the extensive occurrence of grain boundary sliding are attributed to the higher formability of the alloy . Table 1 provides the results of hardness and grain size of the AZ 31 alloys. Figures 3-6 show the microstructure of the multi axial forged AZ 31 alloys for various forging conditions. As seen in Figures 3-6, grain structures are more or less equiaxed for all forging conditions. Also, there is no appreciable level of elongated grains in the microstructure. There are no observations of slip bands, unrecrystallized grains and fibrous structure in the microstructure. These observations confirm the fact that MDFs induce continuous dynamic recrystallization (cDRX) during the forging and refine the grains. Additionally, the kinking mechanism contributes to the grain fragmentation during the MDF [11,12] in contrast to a single directional forging (SDF). In SDF, the kink band forms until the rotation of basal plane from parallel to perpendicular to the loading direction. After that, the kink band formation takes place rarely with any higher, increasing strain conditions and consequently the fine grain evolution by kink band assisted grain fragmentation is ceased . In contrast, the kink band formation continues with increasing strain in the MDF process because the change in forging direction after each pass realigns the basal plane parallel to the loading direction. Table 1: Properties of multi axial forged AZ 31 alloy. Figure 3: Microstructure of the MAFed AZ 31 Mg alloy for the 350°C and ΣΔε = 0.9 condition. Figure 4: Microstructure of the MAFed AZ 31 Mg alloy for the 350°C and ΣΔε = 1.2 condition. Figure 5: Microstructure of the MAFed AZ 31 Mg alloy for the 400°C and ΣΔε = 0.9 condition. Figure 6: Microstructure of the MAFed AZ 31 Mg alloy for the 400°C and ΣΔε = 1.2 condition. 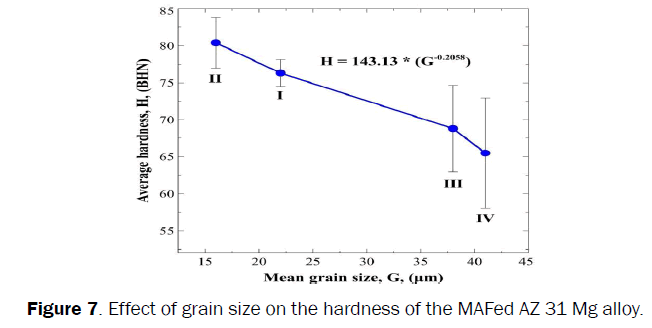 Figure 7: Effect of grain size on the hardness of the MAFed AZ 31 Mg alloy. With increasing strain, the dislocation density increases, the misorientation between grain boundaries increases from low to high angle due to the pile-up of dislocations and kink band formation. The kink band also evolves inside the grains by the intersection of dislocations during initial passes. Yang  reports that the angle of misorientation between grain boundaries rises sharply from 5° to the saturation value of 43° after 50% (0.5) straining the alloy, that serve as an impetus for fine grain evolution. They also reported that the misorientation angle change is insensitive to the forging temperature. With increasing forging passes, the number of kink bands and their intersections, and the misorientation angle between grains (high angle grain boundaries formed by accumulated prismatic slips) increase that eventually result in grain fragmentations . The fragmented grains have high grain boundary energy because they are surrounded by high angle grain boundaries. These boundaries serve as a nucleation site for the formation of new stress- free fine grains by DRX. It is important to note that the DRX is a function of temperature . Any excess of temperature than required increases the thermal diffusion (atomic and grain boundary) of Mg atoms resulting in grain coarsening. Another interesting observation in Figures 3-6 is the absence of deformation twins in the microstructure. This observation hints that the role of twinning in the hot deformation is negligible. Barnett  is reported that the twinning hardly contributes to the deformation when the grain size of the input material is less than 10 mm. Also, the tendency for twinning in the AZ group alloy decreases with decreasing content of Al . As the initial grain size of the billet in the present study is 2-5 mm and the Al content is less, the twinning has not occurred substantially to influence the deformation. At 350°C, the strain induced dynamic recrystallization refines the grain structure of the alloy. It appears that the distribution of grain size is relatively uniform at low deformation condition (working ratio: 0.3 per direction) in contrast to the higher working condition (working ratio: 0.4 per direction), as seen in Figures 3 and 4. It may be because of uniform growth of refined grains. At higher working condition (working ratio: 0.4 per direction), the preferential grain growth is observed that leads to bimodal size of grain structure (mixture of fine and coarse grains) in the microstructure, as seen in Figure 4. It is well known fact that the recrystallization temperature decreases with increasing amount of working because of higher stored strain energy and dislocation density. It is possible that the grain growth phase is much advanced for the case of 0.4 working ratio per direction condition resulting in more grain growth with increasing working strain. This finding is particularly novel because it is in contrast with most of the reports on the forging of Mg alloys that showed the grain size reduction with increasing working ratios [10-12]. It is important to note that those studies were carried out well below the recrystallization temperature (350°C) with varying temperature between passes. At that temperature, the driving force for grain growth is very less and hence, the working ratio plays a vital role in strain induced grain refinement. Increasing forging temperature enhances the grain size of the alloy by thermally activated self diffusion of the Mg atoms. This result is in agreement with Chino  reports on forging of AZ 31 alloy. At 400°C, higher amount of working accelerates the preferential grain growth resulting in rapid grain coarsening, as seen in Figures 5 and 6. Kim  observed similar abnormal dynamic grain growth in AZ 31 alloys above 400°C during the deformation. The measured activation energy for grain growth of the alloy between 400-500°C (Q=109.2 kJ/mol) for single pass ECAPed samples (ε =1) is much lower than both the lattice self-diffusion activation energy (QL= 135 kJ/mol) and the grain boundary (GB) diffusion activation energy (Qgb=92 kJ/mol). The observed much lower Q value for grain growth suggests that a large number of extrinsic dislocations piled up in the GBs make the grain structure non equilibrium and accelerate the atomic mobility resulting in rapid grain evolution and growth . From the above, it is clear that the effect of strain (%working) is not appreciable in grain refinement for both forging temperature conditions, as can be seen from grain size results given in Table 1. The mean hardness of the alloy increased with decreasing the forging temperature. The increase in hardness is ascribed to the grain refinement. This result is in agreement with the Hall-Pitch relation in which the strength of the alloy is inversely related to the grain size. Therefore the hardness increased with decreasing grain size. The hardness variation decreases with decreasing the working ratio. It is because higher working ratio promotes the preferential grain growth resulting in bimodal size distribution of grains in the microstructure. Thus causes the relatively wide variation in the hardness of the forged alloy. Between the forging temperature and the working ratio, it is clear that the forging temperature has greater influence in deciding the grain size/hardness of the alloy. As the grain size has inverse relation with the ductility and the hardness/strength, the alloy forged at 400°C for 0.3 and 0.4 reduction ratios is expected to show poor strength and ductility properties due to severe grain coarsening. Figure 7 shows the relationship between the mean grain size and the average hardness of the MAFed AZ 31 Mg alloy. The curve shows that hardness increases with decreasing grain size of the alloy. The data points are fitted with the power law trend that gives the following regression equation between the grain size and the hardness. Where H and G denote the average hardness, mean grain size respectively. The above equation is qualitatively in agreement with the Hall-Pitch relation, in which the strength of the alloy is inversely proportional to the square root of grain size. • The grain refinement can be retained by decreasing the forging temperature (350°C) and the reduction ratio (0.3 per direction). • Increasing working ratio favours the preferential grain growth resulting in bimodal size distribution of grains in the microstructure, and thus causes significant variation in the hardness..
• The grain growth is severe for the case of higher temperature (400°C) and working ratio (0.4 per direction) forging condition. Polmear I J. Light Alloys: Metallurgy of the Light Metals. 2nd edn. London: Edward Arnold Publishers 1989; 29-235. Mordike B L and Ebert T. Magnesium:properties-applications-potential, Mater. Sci. Eng., A 2001; 302: 37–45. Yang Z, et al. Review On Research And Development Of Magnesium Alloys, Acta Metall. Sinica (Eng. Lett.) 2008; 21: 313- 328. Cisar L, et al. Microstructures and Tensile Properties of ECAE-Processed and Forged AZ31 Magnesium Alloy, Mater. Trans 2003; 44: 476-483. Avedesian M M and Baker H. ASM Speciality Handbook: Magnesium and Magnesium Alloys. Materials Park, OH: ASM International, USA 1999. Kainer K U. Magnesium –Alloys and Technologies. Weinheim: Wiley-VCH GmBH & Co, KGaA 1999. Furukawa M, et al. Bulk nanostructured materials, Mater. Sci. Eng. A, 1998; 257: 328-332. Chino Y and Mabuchi M. Forging characteristics of AZ31 Mg alloy, Mater. Trans.,2001; 42: 414-417. Yang X, et al. Mechanical Properties of Fine-Grained Magnesium Alloys Processed by Severe Plastic Forging, Mater. Sci. Forum,2006; 503-504: 521-526. Xing J,et al. Ultrafine grain development in an AZ31 alloy during multi-directional forging under decreasing temperature conditions, Mater. Trans., 2005; 46 (7): 1646-1650. Yang X, et al. Advances in wrought magnesium alloys, Mater. Sci. Forum, 2005; 488-489: 223-226. Miura H, et al. Microstructure and mechanical properties of AZ61 Mg alloy prepared by multidirectional forging, Trans. Nonferrous Met. Soc. China 2010; 20: 1294−1298. Sakai T and Jonas J J. Dynamic recrystallization: mechanical and microstructural considerations, Acta metal.,1984; 32: 189-209. Sakai T and Jonas J J (2001). Encyclopaedia of Materials: Science and Technology. Oxford: Elsevier, 7079. Barnett M R, et al. Influence of grain size on the comprehensive deformation of wrought Mg-3-Al-1Zn, Acta Mater.,2004; 52: 5093-5103. Miura H, et al. Evolution of ultrafine grains in AZ31 and AZ61 Mg alloys during multi directional forging and their properties, Mater. Trans.,2008;49: 1015-1020. Kim H K (2004). Activation energies for the grain growth of an AZ31 Mg alloy after equal channel angular pressing, J. Mater. Sci., 2004; 39: 7107-7109. Wang Y, et al. An investigation of microstructural stability in an Al-Mg alloy with submicrometer grain size, Acta Mater.,1996; 44:2973-2982.